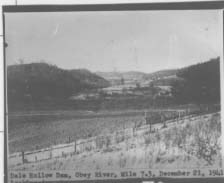 Description: Dale Hollow Dam on the Obey River at mile 7.3. View is looking downstream from mile 8. Shows typical terrain of this area.